In the fall of 1901, the last thing Nashville, Tennessee, expected was trouble from a train robber. After all, it had been more than twenty years since Frank and Jesse James left Nashville, and robbing trains, except in the West, was almost a thing of the past. But a western train robber was about to arrive in town. And Camillo Hanks would prove to be more trouble than the Nashville police could handle. Camillo Hanks, aka O. C. Hanks, aka. “Deaf Charley” was born and grew up near Yorktown, Texas. In the late 1880s, probably because of an assault charge against him, he left Texas and drifted to New Mexico. His stay there was short, and by 1889, he was in Montana working for Charles Farley and the Montana Cattle Company. In 1890 he moved to the Crescent Cattle Company, and in 1892 he went to work for the Murphy Company, where he stayed until mid-summer 1893. Then in August, 1893, along with some friends, Hanks robbed a Northern Pacific train near Big Timber, Montana. A few months later he was captured and sentenced to ten years in the penitentiary at Deer Lodge. After serving eight years of his sentence, Hanks was released on April 30, 1901. Sixty-four days later he joined Harvey Logan (Kid Curry) in another Montana train robbery. 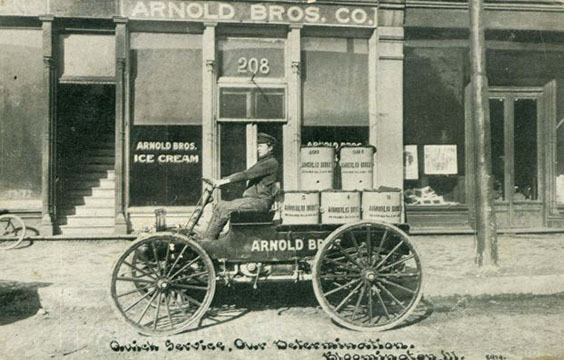 Four months after the robbery, he joined the Nashville police—in the ice wagon affair. The chain of events that led Hanks to Nashville began on July 3, 1901, when the Great Northern Flyer stopped for water at Malta, Montana. As the train crawled away from the station, Ben Kilpatrick boarded the blind baggage. A minute later he scrambled over the coal tender, dropped to the engine platform, and covered engineer Tom Jones and fireman Mike O’Neil with his six-shooters. After traveling a few miles they reached the bridge at Exeter Creek and Kilpatrick ordered Jones to stop the train. There, Hanks and Harvey Logan came from under the bridge. Logan quickly assumed the leadership role and began rounding up the train crew while Hanks and Kilpatrick began firing their guns along side the coaches to keep the curious passengers inside. While Hanks kept a watchful eye on the train crew, Logan entered the express car and blasted open the safe. He then asked O’Neil to lend a hand, and the two men gathered up a few gold watch cases and $45,000 in unsigned Montana bank notes. The three robbers then mounted their horses and rode south toward the Milk River. Following the robbery, Logan, Hanks, and Kilpatrick split up and began traveling around the country. They would visit a city, make the rounds of the saloons and sporting houses, pass a few of the forged bank notes, and disappear. The Pinkertons trailed them to Denver, San Antonio, and finally to Mena, Arkansas. But each time the outlaws slipped away before the detectives arrived. Then on Friday, October 11, Logan and his girlfriend Annie Rogers arrived in Nashville. While they traveling around the country, Logan often gave Miss Rogers money. By the time they reached Nashville, she had more than $500 in $10 bills. Fearing he would try to repossess his money, she decided to exchange the tens for larger bills so that they would be easier to conceal. And on October 14, after telling Logan that she was going shopping, she left the Link’s Hotel and went to the Fourth National Bank. When she tried to make the exchange, however, the teller recognized the stolen bills and stalled while the manager phoned the police. Nashville Detectives Jack Dwyer and Austin Dickens soon arrived at the bank and took Miss Rogers into custody. When Logan learned of her arrest, he quietly left town during the night to avoid arrest. But less than two weeks later, Camillo Hanks was in Nashville, and only the carelessness of Detectives Dwyer and Dickens kept him from joining Annie Rogers in the Davidson County jail. At 10:00 a.m. on Sunday, October 27, Hanks walked into the Newman and Company store at 417 North College Street. He browsed for a few minutes, selected a small item, and handed the woman behind the counter a $10 bill. Because it was early in the day, she did not have change. While Hanks waited she took the bill next door to Harwell’s Drug Store. Clerk Charles Zickler, alerted by the publicity given the Rogers woman, took one look at the crisp, new Montana bill and phoned the police. At 10:30 a.m. Lieutenant Tanksley received the call. Fortunately, at the station were two detectives with experience in such matters. Detective Dwyer and Dickens immediately started for North College Street to investigate. When they arrived Zickler explained what had happened and directed them to the Newman and Company store. The detectives entered the store and found Hanks leaning against the counter. “You’re a stranger here?” asked Dwyer. Hanks, taken by surprise, stammered slightly as he answered, “yes.” Next the detectives asked his name. Without looking up Hanks said, “Ferguson,” in a low voice. Then Dwyer told the soft-spoken stranger that he was being arrested, and the excitement began. Dwyer and Dickens evidently expected Hanks to come along quietly, because they were totally unprepared for what happened next. In a flash Hanks thrust one hand into his coat and came out with a revolver. Dwyer grabbed Hanks’ arm, and Dickens began striking the outlaw on the head with a billy club. For a moment the detectives seemed to hold the advantage. Then suddenly Hanks gathered all his strength, threw both men against a table, and sprang toward the door. Dwyer, seeing his would-be prisoner escaping, drew his gun and fired two shots at the fleeing outlaw. As the bullets splintered the door facing above his head, Hanks darted through the exit. Once outside he turned to his left and ran down College Street. Fifty feet north of Newman and Company sat three men on an ice wagon. Although the wagon was not an ideal escape vehicle, Hanks was in no position to be choosy. He quickly leaped aboard. “Gimme them lines and hop out of there damn quick!” he shouted. Unwilling to argue with the large revolver Hanks carried, the men lost no time in obeying. Hanks lashed the horses, and the wagon rolled past the door where Dwyer now stood. Instead of trying to stop the slow moving ice wagon, the detective waited until it passed before entering the street. Then he ran along behind, firing at the wagon as Hanks urged the horses into a faster gait. Ineffective as Dwyer’s efforts were, his courage far surpassed that of his fellow detective. Dickens either had trouble freeing himself from the table or had a fear of ice wagons. Whatever the reason, he took no further part in the ice wagon affair. A block away an off-duty policeman was standing in Leickhardt’s Drug Store when he heard the shooting. Officer Kiger quickly took a hand in the affair. He rushed to the door just as the ice wagon passed, but seeing a group of people farther down the street, he ran toward the crowd. By the time Kiger discovered that he was going in the wrong direction, Hanks had reached Front Street and was already out of pistol range. Realizing that following on foot was useless, Kiger began looking for a faster means of transportation. First he asked William Bradsford, who was nearby in his buggy, to drive him in pursuit of Hanks. Bradsford firmly refused. As Hanks drove the ice wagon onto the Cumberland River bridge, Kiger spotted a horse and buggy farther down the street. He ran to the buggy, and just as he reached it, Detective Dwyer arrived on the scene. The two policemen jumped into the unoccupied buggy and began pursuing Hanks through the streets of Nashville. By then the ice wagon was across the bridge and rapidly drawing away from the policemen. Hanks turned sharply into First Street. As the fast moving wagon skidded around the corner, a rear wheel struck a water plug. One of the horses fell and broke a leg. Hanks had a sizable lead, however, and he wasted not time in finding other transportation. Isaac Baily had just driven H. J. Dodson home and was on his way back to Dodson’s coal yard when the ice wagon careened around the corner. Before Baily knew what was happening, Hanks was on the seat beside him with the reins in his hands. He ordered Baily out; however, Baily was so frightened he did not move. With no time to argue, Hanks sped down Woodland Street with the policemen not more than thirty yards behind. Hanks’ “borrowed” horse proved to be a much faster animal than the policemen’s, and he soon began to out-distance his pursuers. He turned south on Fourth Street, and when he reached Watson Street, he decided to unload Baily. He stopped the buggy and again told his passenger to get out. When Baily once more failed to respond, Hanks pushed his pistol under the frightened man’s nose and said, “Get out, I’m going to kill you right now.” That brought Baily to his senses, and he scrambled out. Hanks raced down Fourth Street passed the Davidson Lumber Mill, and turned off the road into a region called the Shelby Bottoms. One he left the road he found himself in a field used as a storage area for telephone poles. With the policemen behind him and his path blocked, he paused briefly to consider his options. Then he lashed the horse and recklessly bounced the buggy across the poles. When the policemen tried to follow, they ran into problems. Their borrowed horse, in addition to being slow, refused to pull buggies across telephone poles. Unable to cross, they were forced to take a long detour around the area. Meanwhile, Hanks reached an open field and again drew away from the temporarily stalled officers. He drove across ditches, rocks, and around fences until his horse broke down and could go no farther. Then he jumped to the ground and ran toward the river. Soon after leaving the buggy, however, he came to a horse picketed in the field. He freed the horse, leaped onto its back, and disappeared over a hill. When the policemen finally got around the poles and reached the crest of the hill, they saw the horse standing near the river, but Hanks had vanished. They rushed to the river expecting to see him crossing, but he was not in sight. Thinking he was hiding in a nearby cornfield, they became cautious and decided to wait for help before making a thorough search. When help finally arrived, they found no trace of the fugitive. They would later learn he had paid a boatman to take him across the river before they arrived. On the other side, he walked into the underbrush along the river bank and simply disappeared. Camillo Hanks was gone, but the Nashville Daily News would make sure the ice wagon affair was not soon forgotten. On October 28, its headline read, “Bold Train Robber In An Ice Wagon Outdistances Detectives.” The headline was followed by a story ridiculing the Nashville detectives. The next day the Daily News called for a reorganization of the police force. Finally, that brought a response from the police chief. He scolded the Daily News and hinted that their attack was prompted by the recent assault on a Nashville reporter by Davidson County Sheriff Lewis Hurt. He defended his department, reaffirmed his admiration for the detective force, and insisted it was in better condition than ever before. His counterattack seemed to take the momentum from the Daily News, which apparently decided to allow the disorganized condition of the police department to be forgotten. Needless to say, the police were more than willing to let the matter drop. As for Hanks, his next brush with the law did not turn out as well. On April 15, 1902, he was approached in a San Antonio, Texas, saloon by three police officers. When they tried to arrest him, Hanks reached for his pistol. But he was no longer in Nashville, there was no ice wagon nearby, and the Texas lawmen were accustomed to dealing with such desperados. In the struggle that followed, a bullet put an end to Camillo Hanks’ train robbing career.